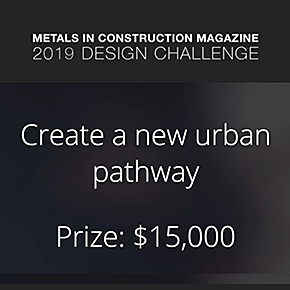 The Metals in Construction Magazine 2019 Design Challenge is a competition to generate ideas for making foot travel a more attractive, engaging component of living and working in a city. With urban environments overly reliant on automobiles, creating elevated, landscaped thoroughfares that encourage foot travel can reduce congestion and improve the overall experience of urban life. One testament to this is the popularity of the High Line’s transformation of an abandoned railroad spur into a pedestrian walkway, stimulating development in adjacent neighborhoods along the way. The High Line captivates New Yorkers in a way that few projects do. It also demonstrates the potential such projects have to revolutionize urban landscapes by serving not just as places for public recreation, but also, when properly designed, as preferred modes of travel for commuters to use on a daily basis.